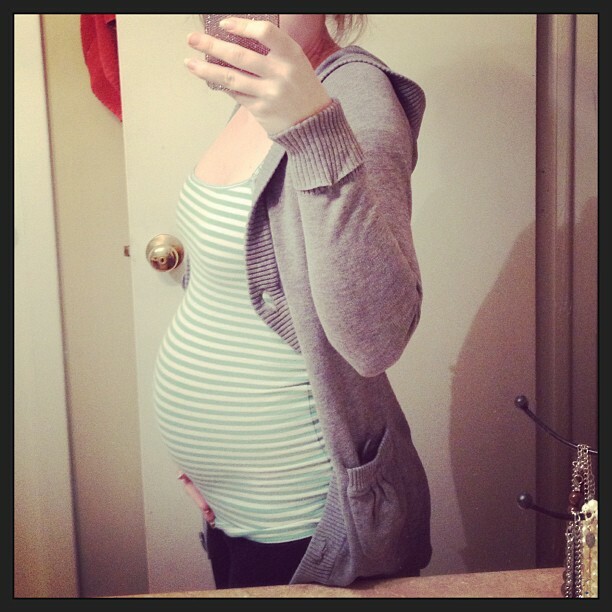 I just snapped a quick mirror shot this week- it's been a long, rough one! Everything with baby is fine, but we started the week with my preschooler being suspended from school (I didn't know they suspended preschoolers, but that's another story) and ended with a death in my family...so I just haven't felt quite up to dragging out the good camera for this week's photo!! I've gotten a little more shopping done this week as well. My mother in law came up to visit for Grandparent's Day at Shaun's school, and stayed the weekend so we did some thrift/yard sale shopping. A few more outfits, some prefold cloth diapers, blankets, towels...my favorite finds were a free bouncer and an Aden + Anais swaddling blanket. The bouncer is super cute-pink and very girly- and had some minor staining when I got it- but a little Tide stain spray and a good wash and it looked just like new! It just needed a little love!! The blanket was a very lucky find- it had been mislabeled as a table cloth at the thrift store...I happened to glance over and recognize the print, picked it up and sure enough discovered it was in fact an Aden + Anais!! And only $1!! Score!! On top of our thrift store finds, I have also gotten extremely lucky and won a few giveaways lately...including the grand prize of the Gearing Up For Baby hop AND a super cute bassinet!! How great is that!? We are slowly but surely getting all our baby needs checked off the list!! Playing peek-a-boo. Sitting her in the bouncer (yes, that's that free one). 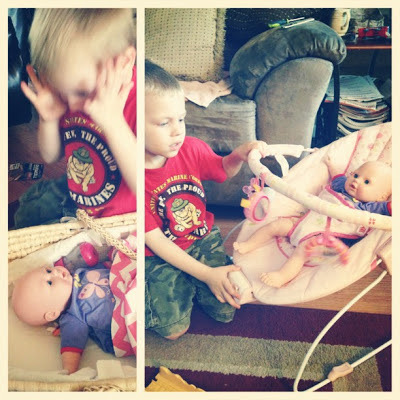 What a great big brother to be! !